NAVAL AIR SYSTEMS COMMAND, Md. – Oct. 31, 2017 – Another major milestone was reached on the E-2D Advanced Hawkeye program this summer, when the first E-2D equipped with aerial refueling successfully received its first in-flight fuel transfer from a tanker aircraft on July 14. During the four-hour flight, the pilots performed 10 dry plugs and two wet plugs, resulting in the successful transfer of more than 1,700 pounds of fuel from a U.S. Navy KC-130 Hercules to the E-2D Advanced Hawkeye. 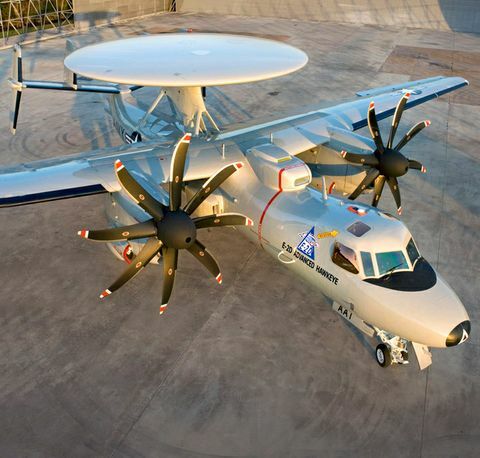 ”Passing fuel for the first time airborne is a significant milestone in the development of this critical technology for the E-2D, which increases the range and persistence of command and control the E-2D provides to U.S. and allied forces,” said Capt. Keith Hash, E-2/C-2 Airborne Tactical Data Systems (PMA-231) program manager. The aerial refueling-equipped E-2D made its first flight Dec. 15, 2016, at Northrop Grumman’s St. Augustine facility. The aircraft was then transferred to Air Test and Evaluation Squadron 20 (VX-20) at Naval Air Station Patuxent River, Maryland, where the aircraft will complete the aerial refueling test program. “Developing aerial refueling capability for the E-2D is another demonstration of Northrop Grumman’s unwavering commitment to provide our Navy customer with increased operational capability,” said Jane Bishop, vice president and program manager of the E-2/C-2 program at Northrop Grumman. NAVAIR public release, SPR-2017-589Distribution Statement A, approved for public release, distribution is unlimited. 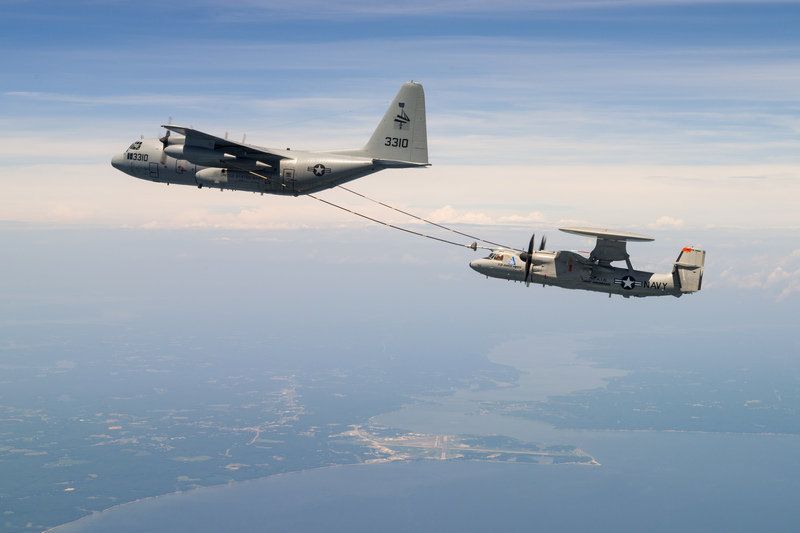 There are two additional aircraft in the aerial refueling test program and while the first aircraft was making its first fuel transfer flight, the third aircraft to be modified made its first flight at St. Augustine. 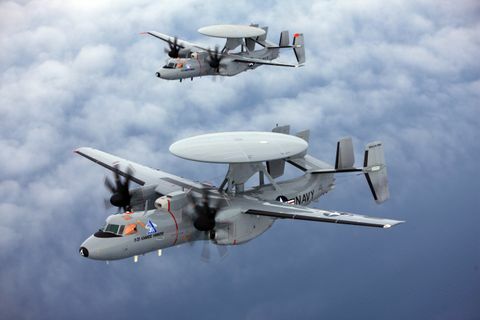 Two E-2Ds equipped with aerial refueling in flight at the same time marks a significant first for Northrop Grumman and the U.S. Navy’s Hawkeye community. The aerial refueling system modification contains several sub-system upgrades to accommodate the refueling capability including adding the fuel probe plumbing, formation lighting, long-endurance seats, as well as flight control software and hardware changes. The U.S. Navy awarded Northrop Grumman the aerial refueling contract in 2013. This capability gives the U.S. Navy the flexibility to conduct missions of more than seven hours. The planned production cut-in will be in 2018, and IOC is planned for 2020. The E-2D aircraft already in the fleet will eventually be retrofitted with the aerial refueling system.